Evolution Live Three Card Poker - Review and Recommendations of where to Play. 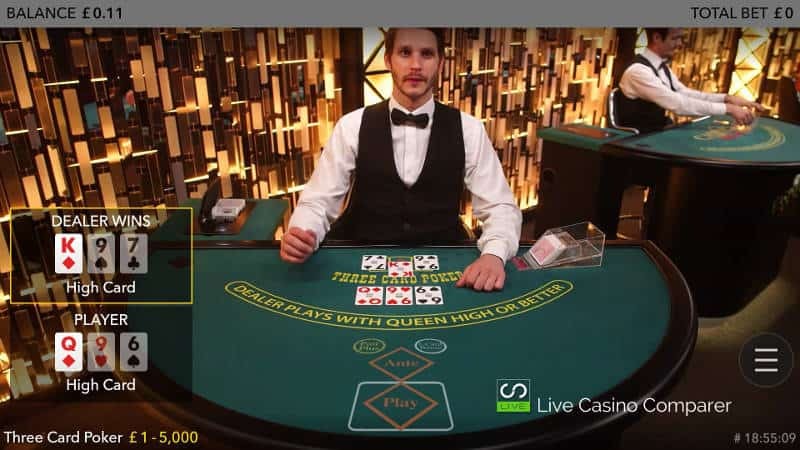 Created in partnership with Scientific Games, Evolution Live Three Card Poker is an online version of the most popular specialty table game of all time. Played with hands of just three cards, the game is fast and fun. It’s easy to understand, all you need is a basic rudimentary knowledge of poker hand values. However that’s not essential. The only decision you need to make during the game round is to bet or not. Knowing when to bet is another matter. That’s why you should follow an optimal playing strategy for 3 Card Poker (which is play anything more that Queen, Six, Four). Three Card Poker differs from conventional poker in other ways, too. With a main Three Card Poker hand, an unlimited number of players can play against the house, not against each other. The dealer needs a ‘Queen High’ to play, otherwise the play bet is returned to the players and the Ante is paid at even money. You don’t need to be a poker expert to join in and play. 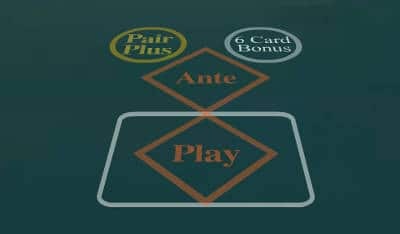 There is an Ante Bonus when the players hand achieves a Straight or better, no matter what the dealer has. 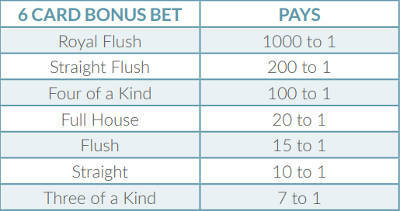 The optional Pair Plus Bonus bet also means that players can win payouts of up to 100 to 1 on a Pair or better. The 6 Card Bonus bet gives players even more chances to win,up to 1000-1 even if they fail to beat the dealer’s Three Card Poker hand. Pairs Plus is an optional side bet in which the player’s objective is to make a pair or better. If the player achieves this, they win, irrespective of the dealer’s hand. Winnings are according to the Pair Plus Bonus Bet payout table with the highest win being a very attractive 100 to 1. 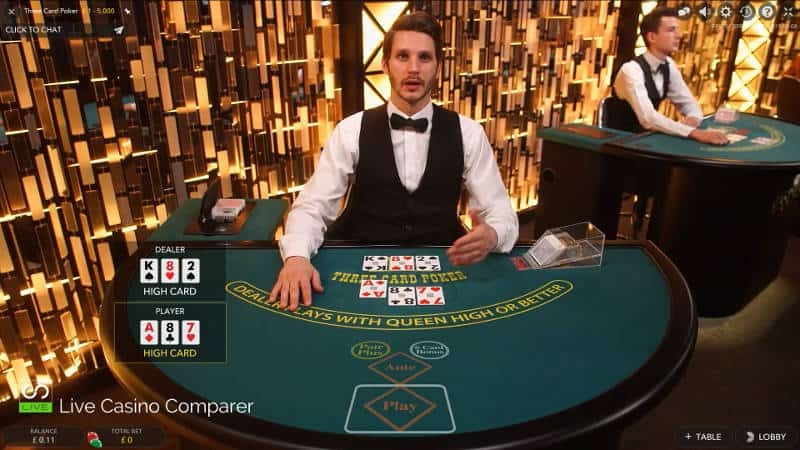 The 6 Card Bonus is an optional side bet in which the player aims to make the best five-card poker hand they can by combining their own three cards and the dealer’s three cards. 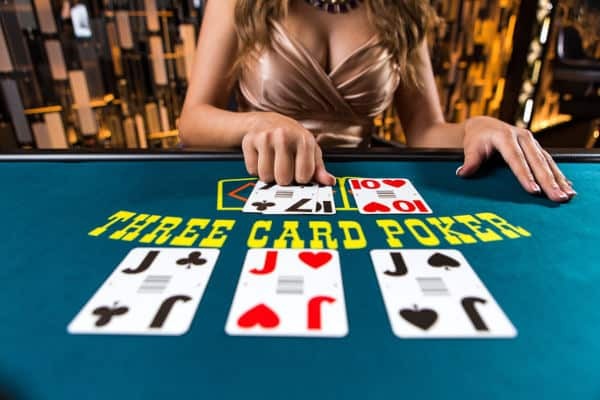 This bet pays on Three of a Kind or better, irrespective of the dealer’s hand, with the highest win being an amazing 1,000 to 1 for a 5 Card Royal Flush. Theoretical Payout 96.63% (based on initial bet). 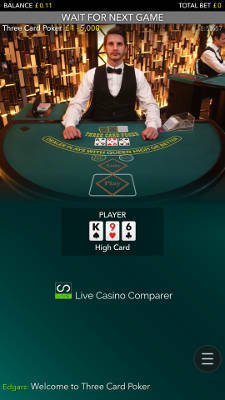 Evolution 3 Card Poker can be played on all device types, in both landscape and portrait modes. The Mobile landscape interface looks and plays very much like on the desktop, while the portrait mode has been specially designed for those that like to play on their phone. There’s not much more to say about Evolution Live 3 Card poker. It’s pretty great as games go. I’m a fan and always will be. And it’s a great compliment to the other live casino poker games you can play. In truth it doesn’t give the greatest return. The side bets make it more exciting, but they will ravage your bankroll if you don’t hit any. It could be improved with more side bet options like Prime, which you see in land based casinos and it would be great if you could squeeze the cards, like you can in Baccarat. All Evolution Live Casinos carry the game. However, given the choice I’d choose a casino that has a dedicated table for Three Card Poker. That’s a table that is branded by the casino and only has their players playing on it. These tables are more often going to have promotions running on them. They also use the same dealers, so you get a better overall playing experience. My top pick would be Genting, followed by William Hill and then Grosvenor Casino.